If you have Browser Hero installed on your computer you are either concerned about your web security or you do not even know how it got there in the first place. Whichever case is true for you, we recommend removing this unreliable application from your system because it is not what it seems to be. Although Browser Hero is advertised as an ad-supported, free web security application on its official website, the only truth in this is the „ad-supported“ part. If you do not remove Browser Hero from your PC, you will have to face a flood of third-party commercial advertisements ruining your browsing experience. If you care about your virtual security, read our report and learn why and how to delete this adware. Our researchers have found that Browser Hero is identical to PriceHorse and Price-hipo, both of which we have covered recently. The conclusion is always the same: adware is like a time bomb, you need to remove it before it might blow up. Like all other adware, Browser Hero also generates revenue through the pay-per-click system. This means that it will show you customized commercials based on the marketing-type data it collects about you, to make sure you click on them. While you might be a user who likes to shop online and would like to have the greatest and freshest deals available, our researchers would advise you against clicking any of these attractive-looking ads. 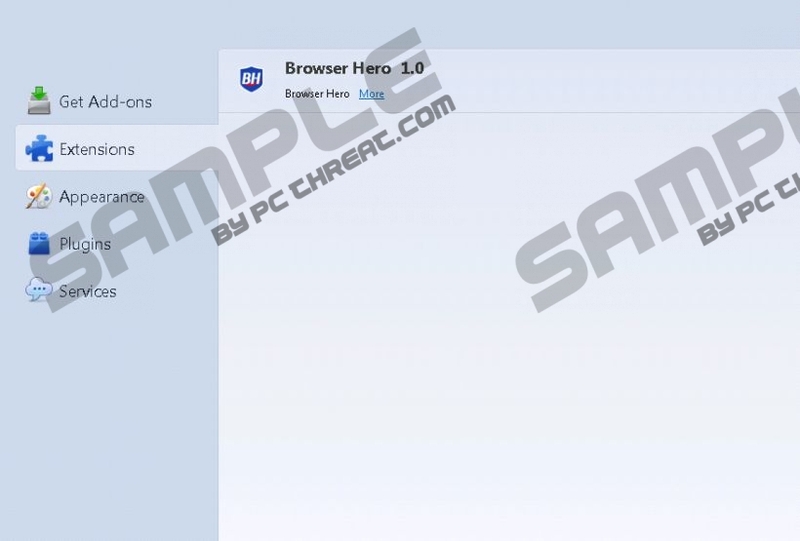 Browser Hero connects to remote adware servers and might display potentially unreliable third-party ads trying to redirect you to websites that might be infected with malware. Therefore, it is important that you remove Browser Hero from your computer to secure your files and your operating system. It is impossible to download Browser Hero directly from its official website, which is located at browser-hero.com. Therefore, you may have downloaded it in a software bundle. Keep in mind that adware may also come bundled with potentially unwanted programs (PUPs) and browser hijackers via third-party installers such as InstallRex, Amonetize, and Vittalia. Most users do not realize that they usually have a choice not to install unwanted applications in such packages. Thus, it is extremely important that you pay careful attention to all the steps through the installation wizard. Otherwise you might end up having to delete all of the unwanted programs if you do not want to risk your privacy or even getting infected by malware. Since Browser Hero affects Internet Explorer, Mozilla Firefox, and Google Chrome as well, you really cannot get away from the ads unless you remove the app entirely from your system. If you use the latest version of Chrome, we have good news for you, because it already blocks Browser Hero. Of course, it does not mean full safety due to the possibility that there might be other threats installed too. In order to solve this potential security issue, first you need to delete Browser Hero. We prepared an easy-to-follow removal guide for you below. After you remove this unreliable adware, we recommend running a full system scan using an authentic antispyware tool. If there are any other infections on your PC you should consider installing a powerful and reliable security tool such as SpyHunter. Navigate the mouse cursor to the bottom-right corner of the screen. Select Settings from the Charm bar and then go to Control Panel. Click Control Panel and then click Uninstall a program. Quick & tested solution for Browser Hero removal. Kinda ironic, it says its a "hero", but its the villain all along!